Municipal Unit of "N. Kazantzakis"
The building complex excavated in the Tourkogeitonia district of Archanes has all the features of the palaces of Knossos and Phaistos, the dimensions, orientation, architecture and rich construction materials, and it is a monument serving both administrational and residential purposes. Like all other Minoan palaces, the palace complex at Archanes was built around 1900 B.C. (Old-Palatial Period), following the same architectural plan. Excavations have indicated that following initial construction small changes were made at later phases. The relics of this building and the Kamares ceramics found here indicate significant wealth. Around 1700 B.C. the first destruction of the Archanes palace occurred, probably due to an earthquake. The palace was rebuilt immediately, but its life lasted only one hundred years, until an earthquake destroyed it again. Crete was experiencing its peak in growth and economic wealth in the “Pax Minoica” period; the Minoans ruled the Aegean Sea and had trade relations with Egypt and the Middle East. The Archanes palace was reconstructed and it is the ruins of this palace that visitors see today. The last flourishing period lasted a little more than two centuries and arts, at their prime, produced significant works. The final fall of Minoan Crete and the palace came in 1450 B.C. However, life went on and the palace experienced a new period of prosperity, this time under Mycenaean rule. The palace complex at Archanes is an important document of Minoan architecture, but its construction is puzzling, when at a distance of 15 km there stood the most important Minoan palace of Knossos. They are like ‘twin palaces’, like those of Phaistos and Agia Trias. The view A. Evans supported, i.e. that it was the summer residence of the kings of Knossos and Phaistos, should be considered rather out of date. It is possible that at such neighbouring palaces resided members of the royal family with various duties and specific powers. At Archanes the royal ruler must have controlled the hinterland of the region, rich in waters and raw materials, while also being the religious leader of the people; this involved significant worshipping locations, such as the temple at Anemospilia and the Peak Sanctuary of Mt. Juktas. At present, the New-Palatial Period is also preserved at Archanes. 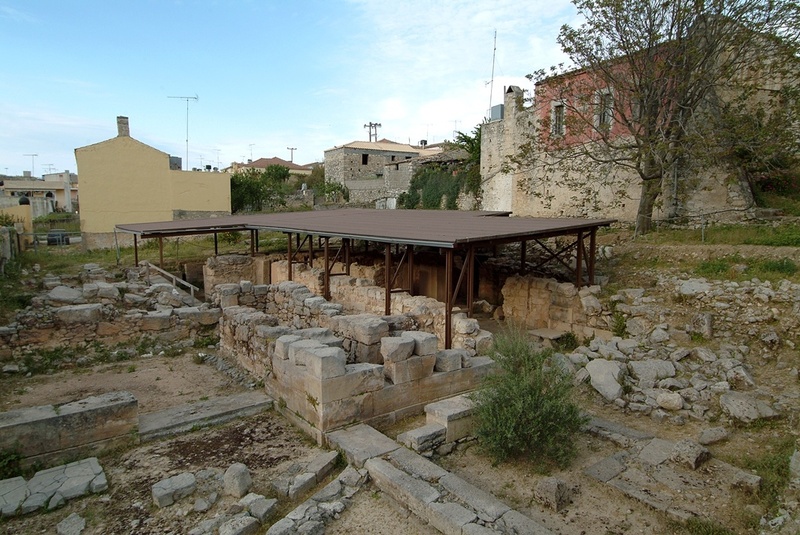 The central core of the complex came to light in the so-called Tourkogeitonia of the present-day town, while close by other sectors have been revealed, such as the theatre location, the archives and the sanctuaries. Some of the walls still stand to a height exceeding 2 metres and they are quite thick (more than 1m), supporting the hypothesis that there were additional storeys. The palace was constructed using different types of stone (tuff, conglomerate rocks, gypsum, soft local limestone, slate and marble in various colours). The interior side of the walls was often decorated with murals and several floors were made using coloured mortars. The central palace yard was discovered in the southeast side of the excavated part, where there is a central monumental entrance and a platform with an altar. In the north part there are various rooms, a small staircase and a skylight shaft. Probably one of these rooms (Room 10, to the west of the entrance) was a sacred space, since the sacred utensils (vessels, sacrificial table) that were originally on the upper storey but found here are evidence pointing to this explanation. The upper storey of the western sector probably did not contain cottage industry premises, but residential apartments, according to the finds, while ground floor premises used the walls of the old palace complex. At this site relics from the Mycenaean Era were also found. Palace workshops were probably at the westernmost part of the west sector (pottery wheels). To the north of the central core of the palace Evans revealed an underground tank, which must have supplied the palace with water. In the southeast part of the excavated area, a theatre location was discovered. It was paved and ‘sidewalks’ crossed it; there was an altar and sacred horns as well. In the southeast part of the central core, a space came to light that contained ceramics and signs bearing Linear A writing. This is where the archives of the palace were kept, and were destroyed by Mycenaean and later strata. In the same space, unprocessed pieces of rock crystal, obsidian and soapstone have been found, confirming that some kind of workshop operated here. The content of this portal has been collected and evaluated by the Municipality of Archanes - Asterousia. The content including images, photos, graphics, texts, textures and in general all the data of the portal is in the responsibility of the Municipality of Archanes - Asterousia. The content update and upload of each region belongs to the Municipality of Archanes - Asterousia which has also the copyright for those content. Given the nature and the size of the Internet, under no circumstances, including the case of negligence, the Municipality of Archanes - Asterousia is not responsible for any kind of loss caused to the visitor/user of the pages, services, choices and contents of this portal, which one undertakes at one’s own initiative. The portal and the Municipality of Archanes - Asterousia do not guarantee that the pages, the services, the choices and the contents will be provided non-stop and without errors and that the errors will be corrected. Furthermore, the portal andthe Municipality of Archanes - Asterousia do not guarantee that the servers, through which it is made available to users, do not contain “viruses” or other harmful contents. 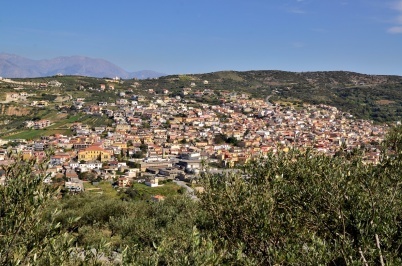 The Municipality of Archanes - Asterousia guarantee the correctness, completeness or even the availability of the contents, pages, services, choices or their results for its Municipality. The Portal and the Municipality of Archanes - Asterousia do not control the availability, the content, the personal data protection policy, the quality and the completeness of the services of other web sites and pages to which it directs users through hyperlinks. Consequently, for any problem arising during their visit/use, the user has to address directly the corresponding web sites and pages, which have the full responsibility for the delivery of their services. The Portal and the Municipality of Archanes - Asterousia can under no circumstances be considered to agree with or accept the content or the services of the web sites and the pages to which it directs users or to be associated with them in any way. I have read the policy. Chaliotis, Angelos “Oi Archanes sta istorika chronia (100 p.H – 100 m.H. )” [Archanes in the historic years (100 B.C. – 100 A.D.). Psilakis, N. “Monastiria ke Erimitiria tis Kritis” [Monasteries and Hermitages of Crete], Karmanor, 2002. Psilakis, M. & N. “Kritiki paradosiaki kouzina. To thavma tis kritikis diatrofis” [Traditional Cretan Cuisine: The Wonder of the Cretan Diet], Karmanor, Heraklion 2001. Psilakis, M. & N. “Ta votana stin kouzina: Mageiriki me epiloges apo to farmakeio tis fysis” [Herbs in the kitchen: Cooking with nature’s medicine cabinet]. Karmanor, Heraklion 2001. Psilakis, N., “Laikes Teletourgies stin Kriti – ethima ston kyklo tou hronou” [Folk rituals in Crete – Customs in the circle of the year], Karmanor, Heraklion 2005. Psilakis, M. & N. “O politismos tis elias: To eleolado” [The civilisation of the olive: Olive Oil], Karmanor, Heraklion 2003. Buondelmonti, C., “Perigrafi tis Nisou Kritis: Enas gyros tis Kritis sta 1415” [A description of the island of Crete: A tour of Crete in 1415] Mikros Naftilos, 2002. Pashley, R. Travels in Crete. Skountakis, Emm. “Archea Eltyna: To Onoma tis Polis mesa apo tis Piges” [Ancient Eltyna: The city’s name through Sources] in Mylopotaki, Aik. K. (ed. ), Eltyna – Sconavi – Kounavoi. Apo ta Archaika sta Neotera Chronia [From Archaic to Later years], Heraklion 2007, pp. 47-65. Specialised Environmental Study of Asterousia, Natural History Museum of Crete, ENDIAITIMA. To Irakleion ke o Nomos tou [Heraklion and its Prefecture], published by the Prefecture of Heraklion.